Flying my Hframe quadcopter fpv. anyone have an aider of what happened? wow, those motors sounded really bad. Im wondering if an ESC overheated and shut down. any melted heat shrink on you ESCs? couple of weeks ago I had a crash in some sand, and after that the motors got worse every flight. you may have sand in a motor. Sand has a knack for getting into places it isnt wanted on moving parts. May want to try taking them apart and giving them a good cleaning. pop off the e clips on the ends of the motor shafts, get a can of compressed air (this stuff you get from office supply stores for clean keyboards) its moisture free so its perfict for cleaning electronics. the tube that they come with also is great for getting into that tiny space between the upper and lower bearings of most motors. I have just disassemble the quad. Now I got two suspects. You could also have damaged the bearings. Bad bearings heating up could lock the motor. Well that's not good! So, any idea how the windings got loose enough to hit the magnets? No ;( only this one winding was full. 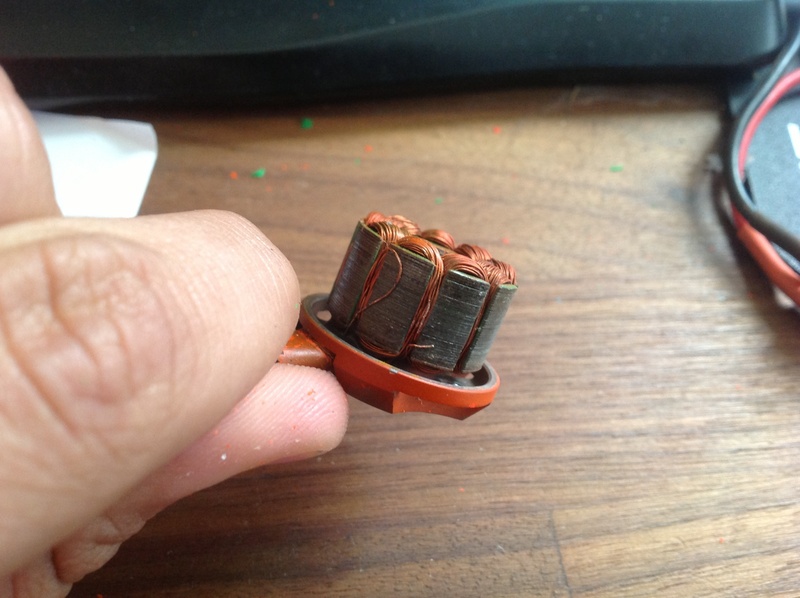 You dont se it on the picture, its more copper on this winding outside of the metal core. The winding on the right, its a smaller winding.